It is impossible not to notice that the quality of the light has changed (golden, redder and hazier), that there is mist licking the Salève and building up around the rivers, that the temperatures are much fresher (even chilly) in the morning and evening, that the leaves on the trees are slowly turning yellow and falling, and that the birds don't sing in the same way as during the summertime. Although I love fall it is always heartbreaking to say goodbye to summer, to the dreams as and hopes that are linked to this sunny season as well as to all the happy-go-lucky feeling that it gives you. When you realize that summer is finished you get quite a shock and have to start a process of mourning (in fact I feel the same every time a season ends - I am a very nostalgic person). Anyway, autumn offers so much to rejoice about (beautiful fruits, vegetables, sceneries, cocooning, etc...) that I am very excited it has appeared! Well, today, as my a farewell to summer and a welcome to autumn, I have decided to post a "Tomato Tart" recipe. Regional tomatoes are still available, but will very soon be taken away from our stalls, so we'd better profit once more of this fantastic fruit before it is too late. This "Tomato Tart" is wonderfully flavorful and so easy to make. The pastry is delightfully buttery, flaky and pleasantly salty, the sweetness of the tomatoes is counter balanced by the light acidity of the balsamic cream and the different condiments add a herby as well as spicy roundness to the whole. A real ray of summer sunshine on our fall table! 3. Pour in water, gradually, while continuously cutting and stirring with a knife. Stop adding water when the dough is stiff. It should not be sticky or wet. Gather up into a soft ball. 4. Dust your working area and rolling pin with flour and shape the pastry by rolling away from you and always turning the pastry around in order to achieve a round shape. 5. Place it in the tart pan and trim the edges. 7. Preheat the oven to 200° C (400° F). 8. Garnish the tart with the sliced onions and tomatoes. 9. Sprinkle evenly the chopped garlic, basil, herbs, olive oil and the cream of balsamic. 11. Bake in the middle of the oven for 20 minutes, then lower the temperature to 180° C (350° F) and bake for another 25-35 minutes, or until the crust is golden brown, crispy and the tomatoes have caramelized. 12. Let cool for about 5 minutes on a rack and serve warm. Eat this tart with a salad (oakleaf lettuce and rocket). Pour une tarte de 26cm. 3. Verser l'eau, graduellement, tout en mélangeant bien (n'ajoutez plus d'eau quand la pâte aura atteint la bonne consistance/ni trop mouillée, ni trop collante). Former une boule. 4. Fariner votre rouleau à pâtisserie et votre plan de travail. Etalez la pâte avec un rouleau à pâtisserie (du milieu jusqu'à l'extérieur) afin d'obtenir une forme ronde. 5. Posez la pâte sur votre moule et découpez l'excédent de pâte. 6. Piquez la pâte avec une fourchette. 7. Préchauffer le four à to 200° C.
8. Garnir la tarte avec les tranches de tomates et d'oignon. 9. Saupoudrer avec l'ail, le basilic, les herbes, l'huile d'olive et avec le crème de balsamique. 10. Saler et poivrer selon goût. 11. Cuire au milieu du four pendant 20 minutes, puis baisser la température à 180° C et cuire pendant encore 25-35 minutes, ou jusqu'à ce que la croûte soit dorée, croustillante et que les tomates aient un peu caramélisé. 12. Laisser refroidir sur une grille pendant 5 minutes et servir chaud. Soulevez toujours la farine lorsque vous la frottez avec le beurre: ça apporte de l'air au mélange. Manger cette tarte avec une salade (feuille de chêne et roquette). Superbes photos ! cette tarte est un bel hommage à l'été qui finit (qui a été quasi inexistant en Lorraine). Ces belles couleurs réchauffent l'automne qui arrive à grands pas ! The tart sounds wonderful Rosa. Here we have tomatoes all the year round and sometimes they are cheaper and better during the winter. Recently I made a tomate tart, from a Vincent Klink recipe, with fresh and dried tomatos, pinenuts or almonds, eggs, milk, sourcream... simple delicious. I'll try your recipe soon. That tart looks so yummy ... I'd be up for a slice of it today! Yes autumn is definitely here ... we had snow yesterday already, though it was such wet snow it is all gone. Still, a shock to wake up to a white world. The worst thing about fall/winter are the lengthening nights. 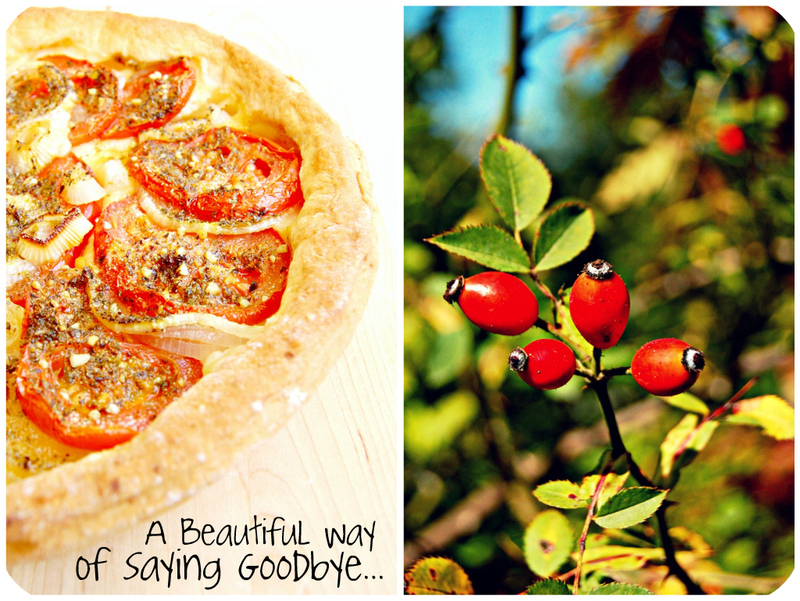 Rosa, your tart is lovely and a very fitting way to say au revoir to summer. I am a summer person from head to toe, so I go into fall kicking and screaming. But with a tomato tart - what a way to go! What can I say it is sublime !!! A wonderful goodbye ! Gorgeous and super delicious tart, yum! Beautiful beautiful tart!! Brava Rosa! 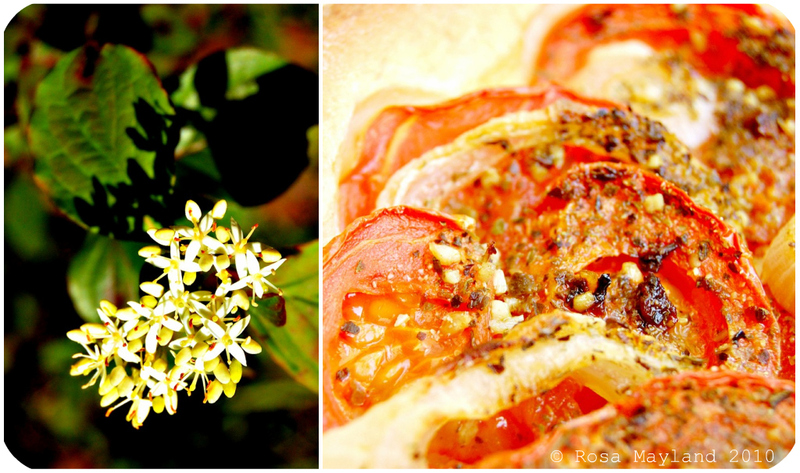 Looks beautiful rosa...a great recipe to keep in mind for our upcoming summer! 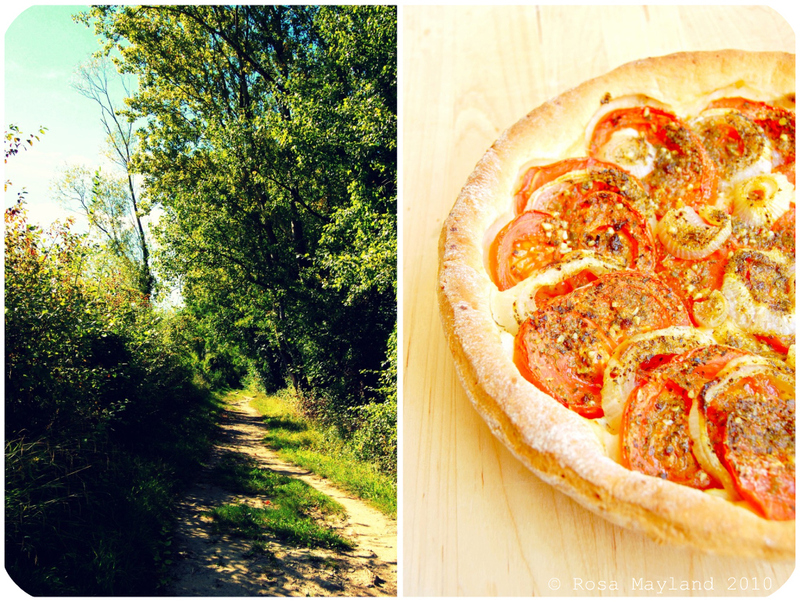 Your Tomato tart bliss was a wonderful way to say farewell to summer. Oh dear, that looks luscious! 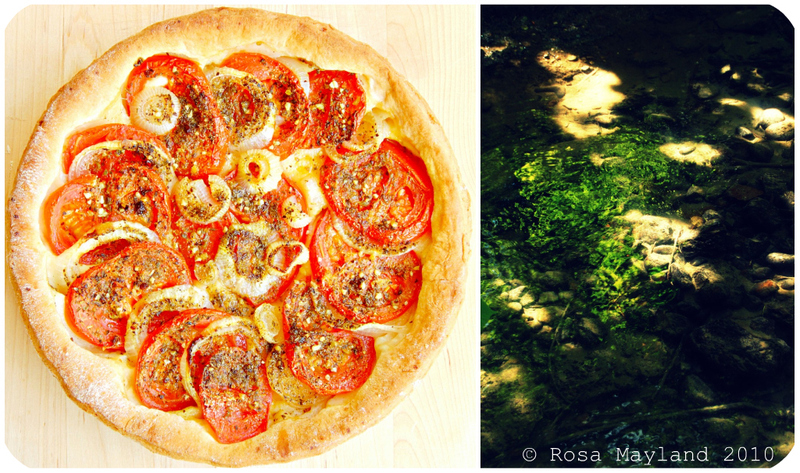 I never made my tomato tart all summer long because it was too hot to bake. And now, here's your delicious creation staring me in the face, and I have not one darn summer tomato to my name. Why. Dark Balsamic cream for this tart sounds really delicious Rosa. Hmm..mm... this looks so seducing! Love it so much. Thank you so much. Wow - those look amazing! I'm heading to my little garden right now and grabbing some tomatoes! It looks absolutely gorgeous and tasty! Simple et délicieuse cette tarte avec une belle pâte épaisse!! What a beautiful tart! Love the addition of the balsamic cream!! Your tomato tarts looks really good. Am glad to have the cooler weather. J'admire toujours les personnes qui réussissent à faire une pâte brisée; j'adore les tartes a la tomate, toutes simples, mais bizarrement, je ne pense jamais à en faire; la tienne est une merveille. Rosa, the tomato tart looks so elegant...and SO good. Love the herbs in it. You are making me drool lady! I'm sure you're aware of my tomato tart addiction so I'm dying to try this, probably on Friday when the working week is over. Stunningly photographed too - nice job! Change from summer to autumn is also tinged with melancholy for me, seeing the days grow shorter but I also love the comfort of autumn food. I love Fall too, but yes, it is hard to say goodbye to fresh tomatoes! Cette tarte à la tomate à l'air vraiment délicieuse! J'aime beaucoup ce type de délice salé. Tes photos sont superbes! What a gorgeous tart! The flavors come together beautifully! I love tomatoes. The tart looks ownderful! It's mooncake festival today! And chuseok! Truly autumn has begun! What a great way to end the summer season! Your tart looks fantastic. Very very beautifully done..can almost taste the herbs and the juiciness of the tomatoes..the crust came out really well too ! 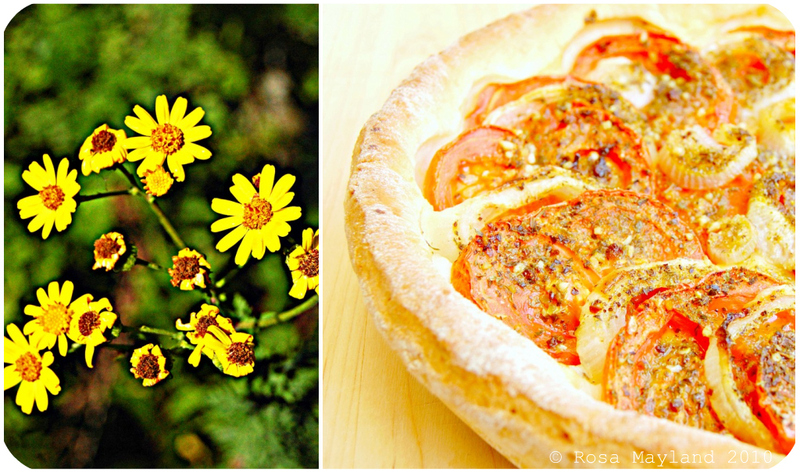 Must try making one of these lovely tarts before all the summer heirlooms disappear for the year. Beautiful tart and perfect for the season! Une tarte à la tomate toute simple, c'est ce que je préfère ... les couleurs sont magnifiques et les photos très belles. i love tomato, so your post invites me to follow your delicious recipe. Your photos are lovely, cheers! Your tart is a tribute to the end of summer as well as the tomato Rosa. Je n'ai jamais cuisiné de tarte avec des tomates mais tes belles z'images donnent envie en titi lol!! Beautiful indeed! Love your description of the sadness of leaving the past season and many great things to look forward to. Looks very pretty! I like tomatoes prepared in this way too. This tart has to be so sweet with the very ripe tomatoes! I love tomatoes and tarts. This is perfect and absolutely a ray of sunshine. I've been meaning to make a tomato tart like this for awhile. Rosa im totally loving this recipe! Looks fresh and tasty! Perfect!!!!! Yumm! I just slow roasted a big batch of roma tomatoes. They are going to be such a good compliment to this tart! Thanks for the yumminess! Looks wonderful and tempting with all those herbs. I am hoping to try this soon. ohhh looks so gorgeous...as always your blog never fail to impress! you are amaizing! Je la fais vendredi !!!! Me réjouis !!! Merci ! Toujours une source d'inspiration ton blog ! Bises ! L'art et la cuisine, quel doux mélange ! J'adore cette tarte que je fais souvent ou du moins sa petite soeur !! mais jamais je n'en ai fait d'aussi belle et lumineuse !! This looks so yummy and is reminding me of the fact that I'm trying not to eat so much pizza! Not that this is pizza, but it looks like it...maybe, instead of pizza, I'll eat tarts instead! There is fall, here is still too cold days. I love this tart, Rosa! Beautiful. I also love seeing how the light changes with the seasons - I'm ready for Fall. What a fantastic way to use tomatoes! Je n'ai qu'une seule hâte que l'été arrive enfin par chez nous... Et pouvoir déguster une excellente tarte à la tomate comme la tienne ! Delicious. I love tomato tart. Such a delicious way to bid Summer adieu! Lovely recipe, Rosa! I've made a similar one with puff pastry but I love the short pastry idea. It looks delicious! That looks great Rosa, it's almost a pizza! Avec toi, les choses les plus simples prennent une dimension poétiquement nostalgique (ça se dit ça ? ;) J'aime le regard que tu nous fait partager sur le monde qui nous entoure et sur parfois ce qui pourrait sembler insignifiant à d'autres. Des bises sucrées (en ce moment). i certainly can't think of a finer way to bid farewell to summer's lusciously juicy tomatoes. gorgeous tart! Such a delicious dish Rosa! Stunning! that tomato tart is simply lovely! C'est une très belle tarte qui prolonge un peu l'été ! Absolutely delicious! Oh so Scrumptious! You are so right - what a beautiful way to say goodbye to summer! Fabulous! truly beautiful way to end summer, you tart looks amazing.. I love une tarte tomate...can in fact have it very season. but yes, it is with a little sadness that we enjoy it at the end of summer, making sure we taste that sun in the tomatoes! so now we'll wait for the quince? Beautiful! This really does say summer! I often make dough for either pizza or focaccia but this will be an amazing change and fantastic meal! Superbe ta tarte aux saveurs d'été ! Les grands esprits se rencontrent, dis-donc !!! I have to admit that I hate to see summer go. In here it is still very warm, like the summer elsewhere during peak summer and we are fortunate to have a month more of it. This is a wonderful tart. i am bookmarking it - the dough is one of the simpliest I have encountered. Reminds me of the Greek Ladenia with the plentiful tomato topping. I love this tomato tart, it looks so gorgeous and delicious! I always love tomato tart! Delicious! Rosa your writing is pure poetry - it is such a wonderful way to bid adieu to summer. The tart is exquisite. Trop forte. Merveilleusement appetissante. Un bel hommage a l'ete qui s'acheve. Rosa I had bookmarked this recipe and made it today. Thank you lovely for such an easy but awesome recipe. The crust was a breeze to make. I made little changes, but basically followed all of yours. Thanks a lot! 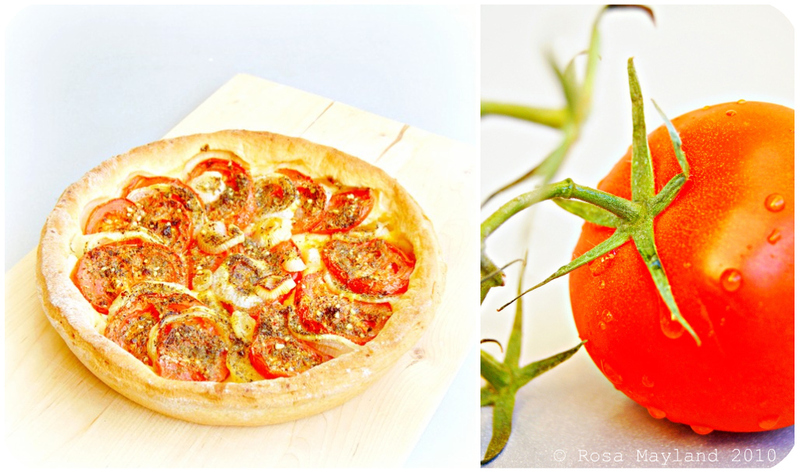 Rosa i will post the tomato tart recipe with your link and mention and the changes I made. Would u mind if I quote you on the notes? as is it is in your blog? I followed all of it and would not want to reword it as mine. let me know (ecurry.admin@gmail.com). Yum, you have lived up to your name. This tart sounds amazing. What a delicious treat to capture the yummy bounty.